Today i wanted to print my notes for my finals examination, i founded that i can't on my printer. It seems dead... Sigh, so i called my mum and she asked me to replace it then. Kinda sad tho, this printer followed me during the times even before i entered diploma. 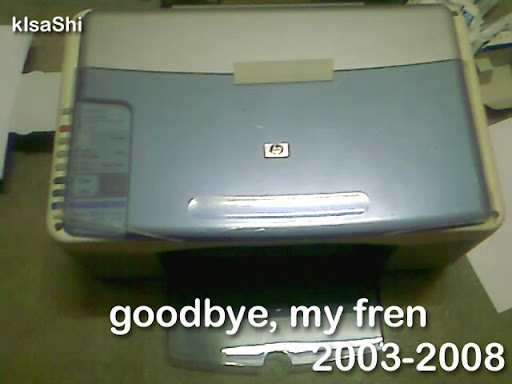 Since 2003... it had been loyal and faithful to me, causing less trouble and even saved me from lot's of last min assignment printing and finals examinations notes, not to forget it's scan and copy function is one of the most convenience tools i had during the days. 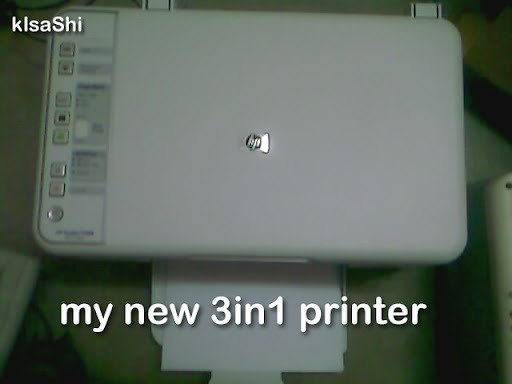 So i proceeded to Stygix in Bukit Beruang to look for my new 3-in-1 printer. With a budget of RM250 i hope that i can get 1 tho, after i googled and founded out that Stygix offered a printer with the price around RM220 on the price list. So, i went to the shop and asked for the same model, but i was shocked that they said the price was old price, new price is RM240 already! This is weird, as i worked in HP before during my years around 2001-2003, i knew HP printers always comes with new design and the old stock will reduce their price to clear stocks. Worse part is, the promoter for that shop or some sales assistant keep pushing me to get Lexmark printer, seducing me with it's function, more ink then HP cartridge and even on door technical help if the Lexmark printer is down. For FREE ! But the price is higher then my budget, which is RM280.